Converting Html to PDF is necessary in many applications. 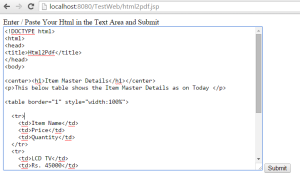 In this tutorial, let us see that how to convert html code into PDF using ITextRenderer. This code accepts html code from a browser and the servlet converts the html code into PDF. itxtrenderer.createPDF(os,true);  // creates PDF from the XML document and writes to outputstream. The above lines of code using ITextRenderer creates PDF from an XML document which was parsed from HTML and writes to outputstream. The below JSP code accepts Html from the browser and send to servlet Html2Pdf. document=builder.parse(new ByteArrayInputStream(html.getBytes())); //Parse the content of the given InputStream as an XML document and return a new DOM Document object. The above code converts the HTML which is well formed. If all the elements of the html is not well formed, then it will throw parsing error. In this case you can use HtmlCleaner to clean html before parsing then create PDF. 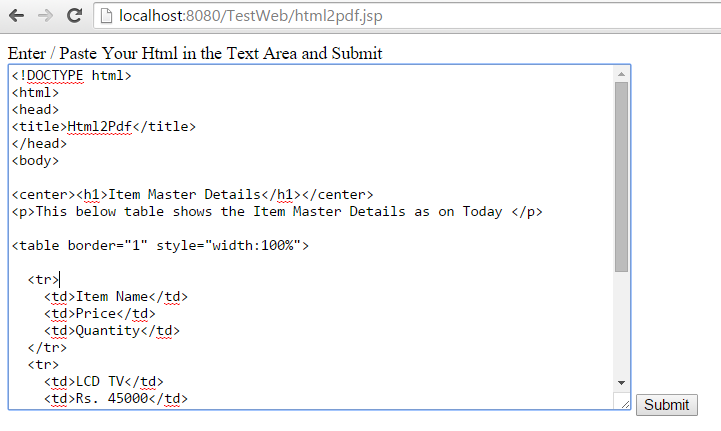 Paste the above example html code into the text area and submit. Now your PDF is generated and downloaded into your local machine. 6 Responses to "Java Servlet code to convert Html to PDF using iTextRenderer example." Interessant post but what about css file ? css style is it applied ? Thanks for reading this tutorial. Yes CSS style is applied. Hi, in your example, Css is inline so is the simple way to generate the PDF. But does it work with External style sheet or Internal Style Sheet ? Just an other one question :), if External style sheet work good, what about cascading style ? Please check the console for errors when you start the server or cleaning the project. Reply with errors so that i can help you.